Cricket & The Media | The International Cricket Hall of Fame. In 1924, the ABC commenced the first radio broadcast of cricket, the first of many electronic communication methods devised to reach a global audience. 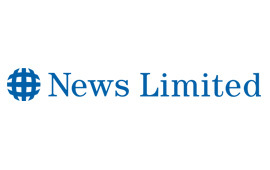 Previously, newspapers and other forms of print media were the main forms of communication. While cricket was first televised in the 1950’s, it was in 1978 that cricket took on a new feel and a new audience. In 1978 the cricket world was shocked by the revelation that 35 of the world’s top players had signed with Kerry Packer’s World Series Cricket (WSC), broadcast via television due to widespread discontent over conditions and pay. Broadcast in competition with the ABC’s coverage of ICC cricket competitions, WSC revolutionized the game with coloured clothing, white balls and a combination of one-day and day-night ‘Supertest’ formats. 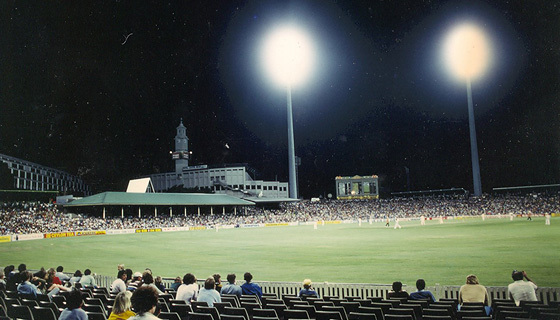 World Series Cricket was initially dismissed as a ‘circus’ but an aggressive marketing campaign, night games and attacking stroke-play saw its popularity skyrocket. Over time, the game of cricket has developed into different formats and with it communication methods. Cricket is now broadcast to a global audience via a range of communication mediums such as print, radio, television, social media and the internet. Follow us with your choice of Social Media. At any major cricket match today, you’ll find a wide array of media and their production teams broadcasting, interviewing and providing ongoing news and commentary to the cricket masses. 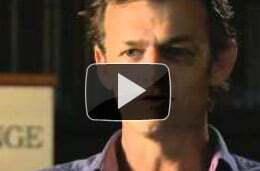 Below is an interview with Channel Nine’s Alex Rolls, Creative Director of Nine’s Wide World of Sports, responsible for the on-air look of the cricket. He has also produced Nine’s cricket telecast for a number of years. 1. What kind of equipment do you use during the match? 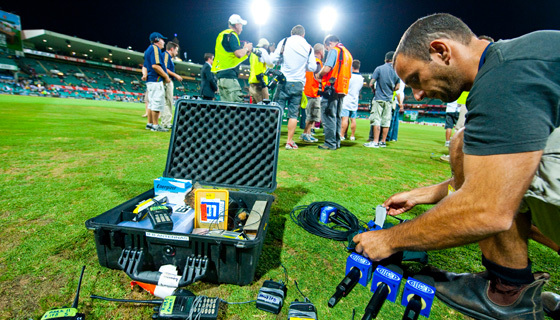 An incredible amount of equipment is used to produce a cricket telecast. Over 30 cameras are used, thousands of metres of cabling, numerous microphones and computer systems, all fed back to a truck from which the broadcast is fed out to Australia and the world. 2. With Stump Cam, do you need to check it after the wicket has been hit? Absolutely, but it’s a very robust camera protected by the stump and of course we can see out of it so it’ll soon become apparent if it has broken. That said, it has been known to break. 3. With players now wearing microphones in some games, do you encounter more issues? Do you train the players on how to use it? 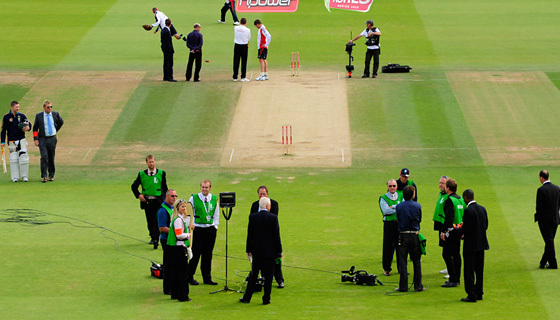 We were very proud to be the first broadcaster to put a microphone on the players for an international cricket match. It’s almost par for the course these days. We have guidelines in place with the players and a protocol to follow when we want to speak to them. The producer will decide who to mic up and then approach the player, who of course has to agree to do so. The producer will liaise with the commentators during the match to decide the best time to speak to them and the director will then warn the player that we are about to turn their microphone on through a little earpiece that the player wears. After the dialogue the director will then turn down their microphone so as not to pick anything up that it not suitable for broadcast. 4. How many cameras are filming one match at any given time? For a Test match over thirty cameras are used as well as our Eagle Eye and Hotspot and Extreme Slo Mo cameras – so almost forty! 5. How big is the production team that makes cricket on television happen? Typically around 80 production personnel. 6. How do you keep up with technology advances with products, such as the introduction of High Definition footage, and of late, 3D technology and footage? It’s our job to. Here at Nine, we always endeavour to be the first with technological enhancements to help the viewing experience as good as we can make it.